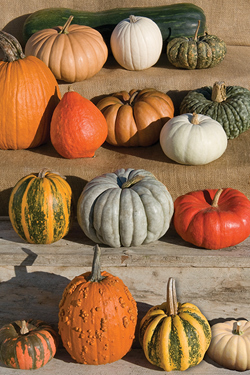 If you have grown or thought about growing pumpkins, winter squashes, and gourds, you have likely noticed how many varieties there are, and with so many available, wondered how to choose which ones to grow. Here at Johnny's, cucurbits are one of our specialties. We offer a wide diversity — some strictly ornamental, some strictly edible, and many that serve both purposes — in all, more than 60 varieties. If you grow for a living, you'll want to match the size of your cucurbits to the markets. Where will you sell them, and what are your customers likely to want? Choose from diverse sizes, shapes, and colors to match your needs. If your focus is selling at fairs or farmers' markets, you probably won't want to transport a crop of huge pumpkins that take up a lot of space in your vehicle. Nor will most customers want to lug heavy pumpkins back to their cars — unless they bring their own wagons, or you can delegate a worker to help them. Many growers do bring a few eye-catching big pumpkins and squashes to farmers' markets, to brighten the stand and spark interest of passers-by. But the bulk of farmers' market sales are likely to be smaller- to medium-size items, under 10 pounds apiece — items that can be easily carried. You can fit a lot more small product into the space occupied by a few large items. What's more, the smaller-sized items, including gourds and pie pumpkins, can have as striking a visual impact when attractively arranged or massed on a table or in a bin. If you are operating a farm-based market — especially one that specializes in autumn activities — you will probably want a prominent display of large pumpkins and squashes. Giant pumpkins like our big white 'Polar Bear' can become the centerpiece of an autumn display that people are sure to notice as they pass by. A percentage of customers who visit the farmstand to purchase ornamentals for home décor will want a large or extra-large pumpkin, too. Anything over 30 pounds ought to be picked by staff and moved to the farmstand, to prevent the possibility of back strain by a customer. For U-Pick sales, a range of sizes from 10 to 30 pounds can be left in the field for customers to hunt and choose on their own, though you may want to provide carts or wagons for them to haul back their finds. Back at the farmstand, there will be ample opportunity to sell smaller pumpkins, squashes, and gourds. Grow a complete range of sizes and shapes to provide something for everyone. 2 • Ornamentals &/or Edibles? Just for show. Most of the big Jack-o'-lantern pumpkins are purely ornamental in nature because they do not develop the sugars that we expect of an edible pumpkin. Likewise, some of the unusually colored and shaped specialty pumpkins serve best for decoration only. As for gourds, there are a number of edible varieties used in certain ethnic cuisines, but the majority are strictly for ornamental use. Plant varieties that are both decorative and edible to maximize ROI. Edible ornamentals. Many of the specialty pumpkins do have excellent eating quality, however, so they can serve both purposes. Many people appreciate the fact that they can use them for decorations, then cook them later on. Varieties that are both edible and ornamental encompass a wide range of colors and shapes, such as the delightfully plump, deeply ribbed 'Musque de Provence' and the bright orange, teardrop-shaped 'Red October'. For anyone supplying CSAs, much of the demand is for edible rather than ornamental products, but again, dual-purpose types lend both interest and value. You might choose to grow small edibles if you transport the CSA shares, larger ones if members pick up at the farm. In the latter case, be sure to have a cart or extra hands to help people get their shares to their vehicles. Another difference to take into account when choosing varieties that are edible and those that are ornamental is that edibles are usually sold by weight, whereas ornamentals are sold by the piece. You might be able to get a dollar or two for a small ornamental pumpkin or gourd. But an edible pumpkin or squash equal in size, sold by the pound or kilo, generally will cost more. Use our Cucurbit Charts to compare spacing, vine length, pathogen resistance, days to maturity, average number of fruits per plant, weight range, color, and so on. Space is another prime concern for cucurbit growers, during both the growing and storage phases. Fruit size. All field-grown vining crops require a lot of land, but especially large pumpkins and squashes. As a rule of thumb, the larger the fruit, the bigger the plant footprint and the lower the fruit count; the smaller the fruit, the the higher the count. Where you might get one 65-pound 'Polar Bear' pumpkin, you could get five 'New England Pie' pumpkins, at about 4 pounds apiece, from the same area. Vine length. This attribute, too, provides some indication of how much space a particular variety will take up, which is why we include it in our Fall-Harvest Cucurbit Comparison Charts. A shorter vine is more desired by growers with less acreage, but also those who want to maximize production from their acreage. Our charts can help you weigh size and yield against other considerations, too, such as disease resistance, color, and shape, when calculating which combination of varieties will make the most efficient use of your available space. Post-harvest handling. Finally, you might also consider your storage facilities when choosing which varieties to grow. If you have ample storage facilities for edibles, and a place to sell them over an extended period of time, you can choose varieties with long storage potential. If, on the other hand, your storage space is limited, it is less important to grow long-keeping varieties; you might want to grow varieties that reach their peak flavor soon after harvest. Refer to our Winter Squash Curing & Storage Chart to compare the average time periods for different types. Taking these considerations into account can really help lend some definition to your plans for fall harvest displays. 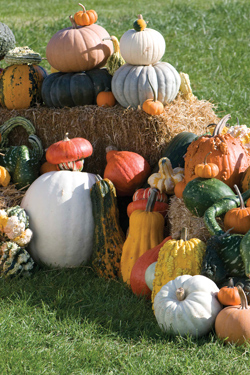 By placing the size, end-use, and space requirements of cucurbit varieties within the context of your markets, growing and storage space, the process of choosing which fall-harvest cucurbits to plant this year becomes a more straightforward exercise. To learn more about characteristics that make winter squash and pumpkins most flavorful, read Eating Quality in Winter Squash & Pumpkins. To learn how long to cure, store, and when best to eat different types of winter squash, see Johnny's Winter Squash Curing & Storage Chart.